Historians of the 1990s will carry the past into the twenty-first century. Now is the time for us to rethink our purposes and practices, to seek and accept new commitments, to give the past a vigorous future. We face a formidable challenge, for contemporary society, with its emphasis on new products and new fashions, ignores the past or reduces it to banalities for popular consumption or political manipulation. The mass media portray disconnected historical figures and disjointed events, providing few opportunities for explication and analysis. Schools, colleges, and universities, too, have devalued the past by compromising the place of history in their curricula. Moreover, the history taught in classrooms and presented in books and articles too often lacks energy and imagination. As a consequence, many students not only fail to gain a sense of history, they come to dislike it. As educational institutions share responsibility for devaluing the past, so also do they have it in their power to restore its value by educating those in their charge to think historically and to use knowledge and understanding of the past to challenge the present and the future. This report is a call to action. History is an encompassing discipline. Its essence is in the connectedness of historical events and human experiences. By examining the causes, contexts, and chronologies of events, one gains an understanding of the nature of continuity and change in human experiences. Contemporary issues, ideas, and relationships take on new meaning when they are explored from historical perspectives. History therefore plays an integrative role in the quest for liberal learning. While acknowledging that our discipline does not have all the answers and that vigorous and longstanding disagreements exist among us, we nonetheless share the conviction that knowledge, abilities, and perspectives gained through the study of history are applicable also in other disciplines. We are compelled, therefore, to claim a central place for the study of history in our institutions' programs. The time is right for us to make such a claim. Many in the general public can be counted upon to support it, for they appreciate the importance of historical knowledge and display considerable interest in the past. They read books on historical topics and figures, visit historical museums, watch documentary films, and are active in local historical societies and projects. Many of them observe the status of history in schools and colleges and wonder why it does not enjoy more respect. Although they might concede that some of their fellow citizens regard history as irrelevant to contemporary life, they care about the place of history in the curricula of schools and colleges. They want to see its place strengthened and its influence enlarged. The study of history incorporates the essential elements of liberal learning, namely, acquisition of knowledge and understanding, cultivation of perspective, and development of communication and critical-thinking skills; it reflects concern for human values and appreciation of contexts and traditions. History, in Carl Becker's phrase, is the "memory of things said and done." Establishing historical memory requires the reconstruction of human actions and events, ordered chronologically or topically. This reconstruction depends upon the acquisition of knowledge that is both broad and deep, incorporating facts, principles, theories, ideas, practices, and methods. Historical inquiry in pursuit of knowledge goes beyond explanations of what happened, and how, to investigation of the "why" from multiple perspectives. Students of history analyze written, oral, visual, and material evidence. Their analyses yield generalizations and interpretations, properly qualified and placed in contexts that reveal the process of change over time. Understanding is the extension of knowledge. Analysis and synthesis contribute to historical understanding and lead to judgments and interpretations. As one's understanding deepens, one moves from the concrete to the abstract, from particular issues or events to well-reasoned generalizations. Historical understanding is enhanced further by connecting it with studies in other liberal disciplines--the natural sciences as well as the humanities and social sciences. An essential ingredient in knowledge and understanding is perspective, cultivated through sensitivity to cultural and geographical differences and awareness of conflicting interpretations of the same occurrences. Perspective is accompanied by a sense of sequence, that is, of the chronological ordering of events, and a sense of simultaneity--of understanding relationships of diverse events at a given moment. Studying history as a discipline requires one to engage one's mind with the facts, ideas, and interpretations conveyed or suggested by historical evidence, to give contexts to discrete pieces of evidence, and to devise plausible explanations and judgments based on the evidence. Such engagement compels one to sift, sort, and arrange what one sees in ways that help one make sense of it. The discipline of history equips one to extend facts, ideas, and interpretations into new realms. One must weigh the validity of arguments, assess the soundness of historical judgments, and otherwise practice the art of critical thinking characteristic of discerning minds. Engagement with evidence--written texts as well as such things as photographs, films, audio- and videotapes, and artifacts--does not end there. Typically, those who examine evidence do not know what they think about it until they see what it leads them to say. In other words, written and oral discourse is essential in gaining historical insights and forming interpretations and conclusions. In coming to know the past, one becomes aware of contrasts between peoples of different times and places and within one's own time and place. These contrasts reflect differing value systems translated into action. Similarly, one becomes sensitive to the artistic interests and expressions of various peoples, demonstrated through their efforts to create and cultivate beauty in forms that help to define them as a people. In a different vein, for centuries, but at an accelerated pace in recent decades, science and technology have played important roles in the story of humankind. Through appreciation of the aesthetic, scientific, and technological forces of the past, one gains a fuller understanding of the complexity of human history. Through engagement with the past in a well-designed major, students come to understand and appreciate how historians gather and weigh evidence, shape and test hypotheses, and advance conclusions. They recognize the continuing need to rethink the past, reinterpreting it in the light of new evidence and new concerns and using new tools of analysis and interpretation. If rethinking history is a continuing theme in undergraduate studies, as it should be, students will carry their abilities to inquire, analyze, and interpret into their studies in other fields and into all aspects of their lives and work. They will be equipped to approach knowledgeably, sensitively, and critically whatever careers they choose. Participate knowledgeably in the affairs of the world around them, drawing upon understandings shaped through reading, writing, discussions, and lectures concerning the past. Appreciate their natural and cultural environments. Respect scientific and technological developments and recognize their impact on humankind. Understand the connections between history and life. Abridged article from the American Historical Association. I totally agree with this article. we Filipinos are an example of a people with a very poor, almost retarded sense of history. It is taught in such a shallow manner, most often simply mouthing facts in textbooks with a rather deceptive "spin". In many ways we are still a conquered people, and until we are able to truly understand our history, we will remain enslaved by it.. I have taken the liberty of attaching an essay of mine that appeared on the Front page of the Malaya newspaper last october 31. It can also be sourced from the BE Not AFRAID movement website at www.888.ph Uncanny that the thoughts shared in this essay affirm the problems we have as a people bacause of our unfinished revolutions.... Much of this is also because we have not learned from our history.. 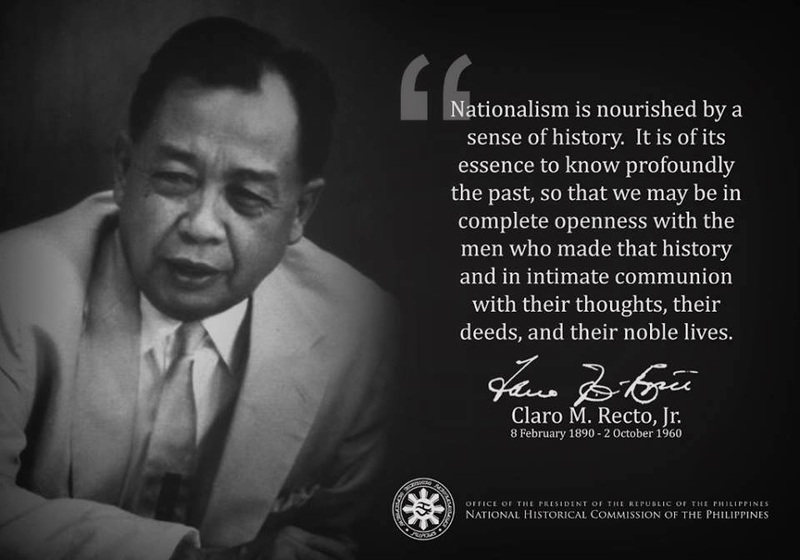 Hence we have yet to achieve a true sense of nationhood. Based on the reactions I have recieved from people who have read it, I believe we as a people are now on the precipice of major change for the positive.. But it will not be easy. Neither will it be without pain and sacrifice. If you feel it is worth it, please share this with others..